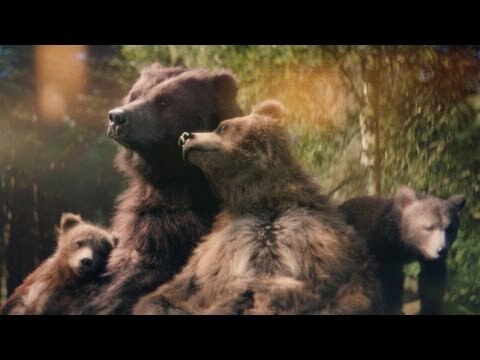 Today we’re delighted to reveal our brand new TV advert, featuring the Bear family. Don’t worry if you didn’t catch the premiere this evening, you can watch it as many times as you like right here. The advert features a family, furrier than ever before. But at the heart of it lies an honest reflection of modern family life: distraction, work challenges and lack of family time. Mama Bear is stuck at work, eager to get home to her family, while Papa Bear is holding the fort preparing dinner as the cubs are in separate rooms. Indeed, a far cry from our advertisements of days gone by – jam-packed with action, adventure and activities. A Center Parcs break can of course still include all of those things, but we were keen to create something different this time. Colin Whaley, Sales and Marketing Director at Center Parcs says: “Families have been telling us that getting the balance between work, chores and quality family time is even more difficult nowadays. As a dad of three myself, I know how hard it can be juggling everything and prioritising what’s important. The advert is supported by a great soundtrack, a beautiful rendition of True Colours by Ben Madeley, first made famous in 1986 by Cyndi Lauper. In a Center Parcs first, our new TV advert was created using live action CGI technology, which took 25 animators a staggering 10,450 hours and more than three months to produce. The team studied footage of bears in their natural habitat so they could capture their movements and mannerisms, so we could reflect this in our advert. The advert was directed and filmed across four different locations, from an empty office block to Center Parcs Sherwood Forest, using professional actors which were then transformed into our animated Bear family during production. We’re really proud of our new TV advert and hope you like it too. Let us know your thoughts in the comments below! Such a beautiful advert, really is truly one the best I’ve ever seen. Certainly inspired me to think Center Parcs and looking forwards to hopefully seeing more in the future.